Did cats really cause "the extinction of 22 Australian mammals"? The RSPCA has released a discussion paper on cat management. I'll be blogging the details of this paper over the coming weeks, with the deadline for submissions being the 27 July 2017. Lots to talk about - so let's just get started. So what is "Woinarski; 22 Australian mammals"? This paper is available here and titled "Ongoing unraveling of a continental fauna: Decline and extinction of Australian mammals since European settlement". It is a brief, published paper of a larger document "The Action Plan for Australian Mammals 2012" which is over 1,000 pages and costs over $100, which is probably why most people quoting the "22 extinct mammals" statistic... haven't read the full paper. ... should have relatively few conservation concerns: its population density is extremely low (∼3 km−2 ) by global standards (∼50 km−2), most of the continent remains very sparsely settled and little modified, and the Australian nation is relatively affluent: indeed, most of the continent comprises one of the world’s few remaining large areas of largely natural environments. 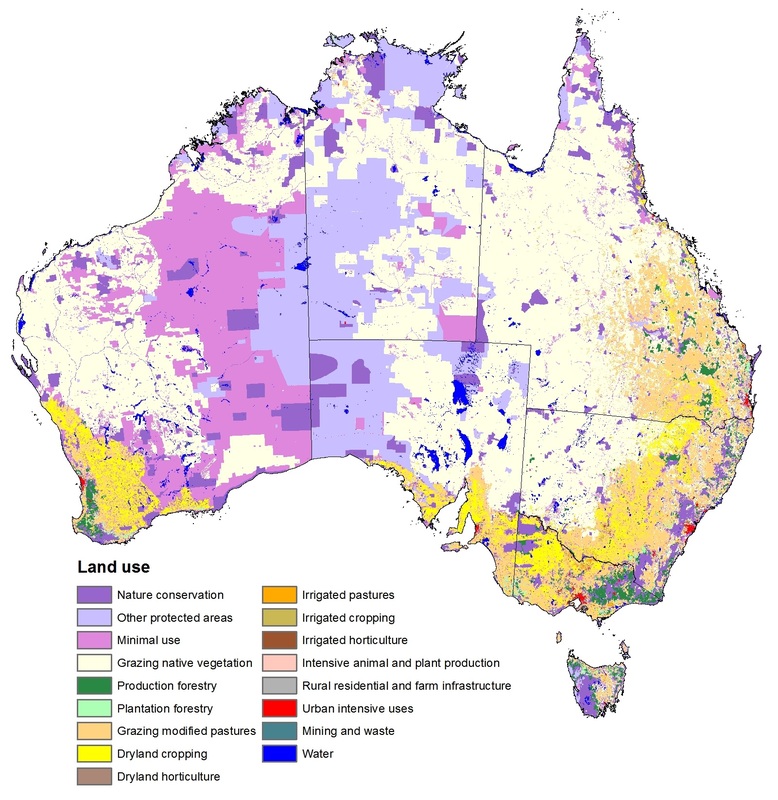 Just 23% of Australia is deemed "Nature conservation/Other protected areas" leaving nearly 80% of Australia being used for other human-centric uses including grazing cattle and growing crops. And to be fair, the paper does pay lip service (on page six) to the idea that cats aren't the only introduced animal causing havoc to native environments - contradicting its own claim that Australia is mostly "natural"
But this is only a short break, before they then they get swiftly back to pointing the finger at the cat. Although the detail of the patterning is imprecise, the available evidence indicates a broad sequential wave of mammal losses, beginning from the first settled areas in southeastern Australia (coincident with the first arrivals of some associated threats) from the 1840s, reaching central Australia in the 1890s with rapid declines there particularly over the period of 1930– 1960, and marked losses continuing from about the 1960s to the present day in much of northern Australia.... Much of this timing was coincident with the continent-wide spread of the introduced cat Felis catus and the slightly later and only marginally less extensive spread of the introduced red fox Vulpes vulpes. Our assessment of 30 Australian mammal extinctions is also appreciably greater than that recognized under Australian environmental legislation, which lists 20 Australian mammal species as extinct, a tally also reported in previous assessments of the extent of loss of Australian biodiversity (26). As noted in previous studies (27–30), the losses of Australian mammal species have been taxonomically uneven, with relatively higher rates of loss in rodent and marsupial species, and relatively less loss in bat species. So what 22/30 native animals are we talking about? Let's look at them below. What 22 (30) species went extinct because of cats according to Woinarski and the RSPCA? It is also claimed that the species may also have caught a disease, or became a victim of predation by Tasmanian Devils. Verdict: Extinction caused by cats? Nope. Just nope. The Western Long-beaked Echidna may have been a "rare" species in Australia prior to 1788. It was last seen around 120 years ago, and has only been collected once in Australia; in the south-west Kimberley of Western Australia in 1901. It has not been collected or reported since. The station on which this specimen was found had been "settled and grazed" by the time that the only known specimen was found. Frequent, more extensive fires became the norm after pastoralism was established and Aboriginal people moved to settlements, as "fire regimes in the western deserts changed from mostly small fires resulting in a mosaic of fire ages to one of infrequent, very large summer fires, with consequences for food availability and habitat suitability demonstrated for small desert macropods"
It is noted that large echidnas were also probably hunted for food by indigenous people. The reasons for its extinction in Australia are noted as "speculative" and "unknown" and now these echidnas are restricted to the Vogelkop Peninsula region of Papua Province, Indonesia. Verdict: Extinction caused by cats? Unknown and speculative at best. Probably cascading environmental factors including pastoralism. This species had a sparse distribution and was never abundant. It became extinct probably 120 years ago, in the early to mid-1900s and before many studies had been undertaken on it. According to Indigenous Australian oral tradition this species was rare even before the arrival of Europeans on the continent and was in a serious decline even as it first came to scientific notice in the middle years of the 19th century. The cause of the extinction remains uncertain: neither... the fox and the rabbit, had yet arrived in south-west Western Australia when the pig-footed bandicoot disappeared from that area. Feral cats were already common, which may offer an explanation; it is perhaps more likely that the decline was caused by a double habitat change. Firstly, the end of many thousands of years of Aboriginal burning which, being confined to a patchwork of small areas at any one time, had ensured both fresh new growth in the recently burnt areas and adjacent older growth for shelter and as a base for recolonisation. However, Australia's Aboriginal population had declined by around 90% during the 19th century, largely because of the introduction of European diseases, and the remaining Aborigines were often no longer permitted to carry on their traditional land-management and hunting practices. Sheep grazing severely degraded the habitat needed by this species to survive as it nested on the ground or in grass-lined burrows. There is also speculation that there was a disease outbreak which is "considered to provide a more satisfactory explanation" of early declines in WA than predation by feral cats. Verdict: Extinction caused by cats? Unknown and speculative at best. Probably made extinct by an introduced disease, combined with cascading environmental factors, including pastoralism. The last time this species was collected was in 1943, though it is reported that "people were eating it" right up until 1960. It was believed this species was a variation of the Western Barred Bandicoot (Perameles bougainville) up until 2012, when it was given its own species classification. It was found the deserts in western and central Australia. Rabbits may have competed for food, and changes in land management saw increased summer lightening-caused fires which reduced habitat complexity and eliminated shelter and food. The Desert Bettong is known from a single specimen collected in 1933 and has not been recorded alive since then. It was only recognised as a separate species from the Boodie (Bettongia lesueur) in 2013. Its range is unknown. It was probably vulnerable to fire regime changes which increased the number of summer fires, which destroyed its habitat and food sources. Verdict: Extinction caused by cats? Very little information known about the species. Speculative at best. Nullarbor dwarf bettong is only known from subfossil records and is considered extinct at european settlement. Verdict: Extinction caused by cats? Very little information known about the species. Probably cascading environmental factors including pastoralism. This species, even before European colonisation, was apparently never abundant, and may have been put under pressure by overhunting by indigenous Australians. It was last recorded in 1935 where it was discovered by pastoralists who caught 12 specimens. Verdict: Caused by cats? Very little information known about the species. Probably cascading environmental factors including pastoralism and being hunting. The last specimen was obtained in 1895 - or 122 years ago. Most accounts note that it was a rare species. Along with disease, changes in fire regimes and increased sheep grazing are evidenced as causing this species demise. Verdict: Caused by cats? Very little information known about the species. Probably made extinct by an introduced disease, combined with cascading environmental factors, including pastoralism. The Lake Mackay hare-wallaby is known only from a single animal collected in 1932. It was also hunted by Aboriginal people, who referred to it as the ‘deaf one’ and sometimes the ‘stupid one’ as it did not flush from its shelter, and could sometimes be caught by hand. Verdict: Extinction caused by cats? Unknown and speculative at best. Probably cascading environmental factors including pastoralism and being hunted. The last known species was collected in 1890, or 127 years ago. This species is believed to have been affected by the build up of sheep numbers to a record 55 million in New South Wales in 1892, and the major changes in vegetation structure and biomass that would have resulted, which left these animals vulnerable to fox predation. Verdict: Extinction caused by cats? No. Probably instead cascading environmental factors including pastoralism. It is believed that by 1924 the population had been reduced to one small group on a station in SA. The last known animal died in captivity in 1939. The reason for extinction is believed to be catastrophic habitat loss, with their whole range becoming agricultural land. Verdict: Extinction caused by cats? No. Probably cascading environmental factors including pastoralism, land clearing and being hunted. The wallaby remained common, even in agricultural districts in the south-west of Western Australia, until about 1900. It had begun a steep decline by 1908, when the last wallaby was caught in the area. The last specimen of this wallaby to be collected alive was caught in a dingo trap on the Nullarbor Plain in 1927 or 1928. W.A. Mills sent it to Taronga Zoo in Sydney and the animal ended up in the Australian Museum. Habitat degradation, including changing fire regimes and the impact of rabbits and introduced stock, may have had an impact. In part of their range (south-western Western Australia and parts of New South Wales), pastoral expansion leading to habitat degradation, mainly by sheep, was likely to have been detrimental to the species. Verdict: Extinction caused by cats? Probably cascading environmental factors including pastoralism causing vulnerability to fox predation. This species was found only on Percy Island off the southeast coast of QLD. The species has not been collected for nearly 160 years. Timings or causation of the extinction of this species is speculative. There is a high incidence of extinction of island species caused by habitat loss and cyclones. There is also scientific debate as to whether this is a distinct species and/or native to Australia. Verdict: Extinction caused by cats? No. This species is only known from a single skull found in 1975 on Lord Howe Island. It has never been found alive. The only known specimen (an incomplete skull) was collected from a ledge in a cave that may have been an owl roost. Various owl species were introduced to the island to control black rats. Owls are known to prey on bats. This species was restricted to Christmas Island and went extinct in 2009. The cause of the Christmas Island pipistrelle's decline is unknown. Several potential threats have been suggested: predation or disturbance at roost sites, and disease. Habitat loss and alteration, altered prey availability, vehicle related mortality, climatic conditions (e.g. cyclones, drought and associated wildfires), disease and decreasing population size may also be potential threats to this species. It has also been speculated that an unidentified health threat, or poisoning from the insecticide Fipronil used to control yellow crazy ant 'supercolonies' could have been responsible for the decline which took place rapidly between 1994 and 2006. Verdict: Extinction caused by cats? Unlikely. Instead cascading environmental factors including predation by multiple species, habitat loss, disease and/or poisoning caused the population collapse. The last of this species was collected in about 1845. There has been no records of this species since the 1860s - or about 160 years. Rats may have spread diseases or competed for food with the white-footed rabbit rat. While the demise of Aboriginal firestick farming, which maintained woodland, may have made the rabbit rat extinct. It is assert that it “...appears to be premature to link its demise to the feral cat” and note that researchers of the time made no reference to cats being part of its range. In some areas decline of this species coincided with establishment or intensification of grazing, and this species was also trapped and/or poisoned by settlers defending their supplies. Once abundant, the species is believed to have vanished completely and with remarkable suddenness. Verdict: Caused by cats? Most likely another threat, probably disease. Never recorded alive and only recognised as a species recently (2010), this species has only been identified by sub-fossil records so no date of extinction is listed and little is known about it. Verdict: Extinction caused by cats? Unknown and speculative at best. The last two specimens were collected in 1933. It was easily tamed, sometimes climbing onto tables to get sugar. It was also eaten by people. The last capture was filmed on 18 July 1933, when the stick-nests were set alight (and the animals captured). The specimens are held in the South Australian Museum. Habitat degradation, particularly in refuges after drought, caused by introduced herbivores (mainly rabbits and sheep) before and leading into severe drought conditions. (Predation by cats) was exacerbated after habitat degradation. Verdict: Extinction caused by cats? Only in combination with cascading environmental factors including predation by multiple species, habitat loss, disease and/or poisoning caused the population collapse. This species has never been recorded alive, with the only two specimens obtained in 1896 - or 120 years ago. The species was hunted, and vulnerable to habitat changes. This species was last recorded alive by two specimens obtained in 1901 - or more than 100 years ago. Last specimen collected in 1843, or more than 170 years ago. The Large-eared Hopping-mouse’s habitat, loamy valley soils with grass, was used for sheep herding at the time of extinction; this would have degraded its habitat and collapsed its burrows. Known only from a single skull without skin collected in the 1840s. Burrows and food would have been damaged by stock. This species was never collective alive, but is believed to have become extinct around the 1860s or 1870s, or around 150 years ago. This species is only described from specimens collected in the 1800s, or over 200 years ago. The Blue-grey Mouse is listed as Extinct because it is known only from three specimens: two collected before 1892, when they were presented to the Natural History Museum, London, and one accessed by the Australian Museum, Sydney, in 1956; surveys have failed to locate it. Habitat loss and fragmentation - severe catastrophic - entire - most of presumed former range is cleared. Verdict: Caused by cats? No. Probably instead cascading environmental factors including pastoralism. This species has not been collected alive since 1856 - or more than 160 years ago. This island species of a few hundred individuals, is restricted to a single small island off the coast of QLD. The island is vulnerable to storm surges and tsunamis. Verdict: Extinction caused by cats? No. Likely environmental. This island species only appeared on Christmas Island and became extinct within 20 years of discovery, with the last animal recorded in 1902. Andrews (1909) speculated that introduced Black Rats Rattus rattus had brought an epidemic disease to the island that wiped out both native rats. Nearly 100 years later, the mystery was finally solved by Wyatt et al. (2008), who used ancient DNA methods on samples from museum specimens of these rodents collected during the extinction window (AD 1888–1908), and showed that endemic rats collected prior to the introduction of Black Rats were devoid of evidence of a pathogenic trypanosome (carried by fleas hosted on recently-introduced Black Rats). To Andrews, the disappearance of such an abundant animal in such a short time had to be due to disease because R. rattus was not present over the entire island. It was unreasonable therefore to assume that the native species had been out-competed by R. rattus all over the island. Verdict: Extinction caused by cats? No. Likely a disease. This island species also only appeared on Christmas Island and became extinct within 20 years of discovery, with the last animal recorded in 1899. Verdict: Extinction caused by cats? No. Likely a disease (see above). If you've managed to read all the way through this document, one thing should be clear. If we're going to advocate for the removal of cats from our landscape as based on this "22 extinct" mammals statistic, we need to give even more credence to the notion of the complete and total removal of sheep and cattle from the landscape also, as these species not only caused the environmental cascades which lead to cats being deemed a "problem" - but that continue to keep Australia from returning to the "natural" state so prized by the environmentalists leading the charge against cats. Disease as a primary factor is considered to provide a more satisfactory explanation of early declines in WA than predation by feral cats. Species affected by disease Most records of species decline explicitly (though speculatively) linked to disease were of the most conspicuous species, namely Trichosurus vulpecula, Bettongia lesueur, B. penicillata, Setonix brachyurus, Pseudocheirus occidentalis, and Myrmecobius fasciatus. There were also numerous records of early declines of these species without them being linked explicitly to disease. A few records stated that ‘all small marsupials’, ‘marsupials’ or ‘all rodents’ had disappeared as a result of disease.